A hand saw is not as powerful as a chainsaw, but it can also get the job done. Likewise, it’s not always a wise decision to use a chainsaw. For one, you wouldn’t want to wake up the whole neighborhood when you just want to cut down a small or medium-sized tree. With that in mind, let’s look at the best hand saw for cutting trees. You might be wondering why anyone would get a hand saw when a chainsaw can do the same thing. Well, we have a few arguments as to why it’s still a good idea to get one. If you have a tight budget, you should definitely get a hand saw for your tree-cutting needs. Since it does not need any engine or fuel compartment whatsoever, the cost of owning a hand saw is significantly lower than that of a chainsaw. Instead of splurging a hundred bucks on a heavy-duty chainsaw, you can buy a reliable handsaw for a third of that price. Hand saws are designed light enough to be used without experiencing immediate fatigue. After all, you will be exerting physical pressure to move the saw against the tree you want to cut. Thus, the materials are carefully chosen to be effective yet light. For example, tubular steel is a tough yet light material for hand saws. As mentioned before, tubular steel allows hand saws to be sturdy yet light. While you may have to replace the blade of the hand saw, possibilities are that you won’t change it at all. The best hand saws have carefully fitted blades to assure optimal performance. One of the best things about a hand saw is that it can be quickly stored in your shed or car trunk. To those who are both budget and space limited this is a more viable option. You can pretty much carry it anywhere due to its compact design. Before you buy your own hand saw, you must first take note of several factors. The hand saw must feature an ergonomic design: light weight of the tool, non-slip and non-conductive grip. Your muscles will eventually get tired, but a well-designed hand saw will enable you to work longer than expected. Likewise, a steel tubular design will not only improve grip but also performance. The blade will determine how fast you can cut down a tree. If it’s flimsy, you’ll get tired without accomplishing your task. Moreover, a weak blade can be broken after just several uses on the hardwood. Ideally, the hand saw must have hardened steel blades. These are incredibly tough blades that don’t lose sharpness and are not affected by tension adjustments. Speaking of tension adjustments, the hand saw must have a feature that will allow you to conveniently change the blade tension. Contrary to what many people believe, you don’t actually need to use the hand saw at maximum tension all the time. Sometimes, it makes perfect sense to lower the blade tension. The hand saw must feature an exceptional grip. Without a good grip, your hand could easily slip away from the hand saw and injure you. Moreover, there must be a knuckle guard to stop the saw from hitting your hands in case it does slip off. Apart from a good grip and knuckle guard, your hand saw must come with a protective sheath. We all appreciate sharp blades, but we need to completely cover them as we put them in the storage area. It’s not uncommon for some people to get a minor cut just because they were looking for their cutting tool in the dark. Thus, it’s important to check the quality of the sheath itself and if it entirely covers the blades. While hardened steel blades are sturdy, their overall sharpness can be affected if maintenance is not properly conducted. Thus, the hand saw must be designed to allow quick blade replacements so you can get back to cutting trees in no time. Just like chainsaws, the blades of handsaw vary in length. The small-sized hand saws have around 17 inches long blade. These are good for pruning trees and other light garden maintenance tasks, particularly those in narrow areas. On the other hand, the bigger hand saws can have 30-inch blades. These are much more capable of cutting logs and trees in a relatively short span of time. The first hand saw reviewed weighs just 1.7 pounds and comes from Irwin. This hand saw is designed with a high-frequency welded frame that grants decent stability and speedy cutting. As the name implies, this hand saw allows you to use a 12-inch blade - the shortest blade among all those reviewed products that can cut either wood or metal. For safety features, the Irwin 218HP300 12-Inch Combi-Saw has a knuckle guard, a protective sheath, and an anti-slip grip. Also, the handle material is made out of premium tubular steel for a light yet sturdy build. We also noticed that the hand saw hand was designed for easy blade replacements. If you have small hands, the fit of these hand saws will be good regardless if you use one or two hands. 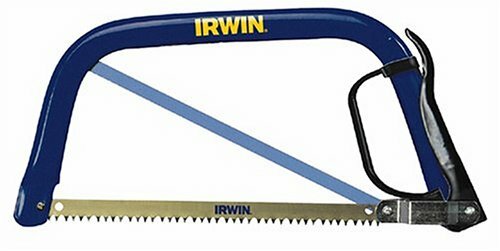 For trimming bushes and cutting down small-sized tree limbs, this Irwin hand saw works fine. It’s light enough to carry for your next camping trip, and there is no assembly needed. However, the Irwin 218HP300 12-Inch Combi-Saw can only cut down small trees. In addition, the wingnuts tend to fall off during cutting operations. If you will only be cutting small trees occasionally, this lightweight hand saw should do the trick. Up next, we have the light bow saw from Fiskars. It has a 21-inch blade, which is pretty good not only for pruning but also cutting trees. The blade is reinforced with carbon steel to keep it as tough as possible. The Fiskars 7029 21-Inch Bow Saw can handily cut thick branches and maintain sharpness after several uses. Also, the lengthy blade is rust-resistant. If the blade somehow becomes dull, Fiskars has replacement blades available for order alongside a lifetime warranty. Like other hand saws, this model utilizes the tubular steel frame for lightness and sturdiness. As for safety, a tension lever serves to adjust the blade and to enhance the user’s grip. If you do not like wearing protective gloves, you might not have a comfortable grip on the padded handle. Still, the lightness of the Fiskars 7029 21-Inch Bow Saw will keep you cutting trees without exhaustion. The compact design, and the adequately spaced blade teeth ensure effective cutting. However, the rivets could have been more durable since they feel flimsy. The Bahco bow saw is designed with steel tubular frames to maintain lightness despite the use of a 36-inch blade. Specifically, this hand saw is only 1.9 pounds heavy. Likewise, the blade is made out of hardened steel to reduce the need to sharpen it. 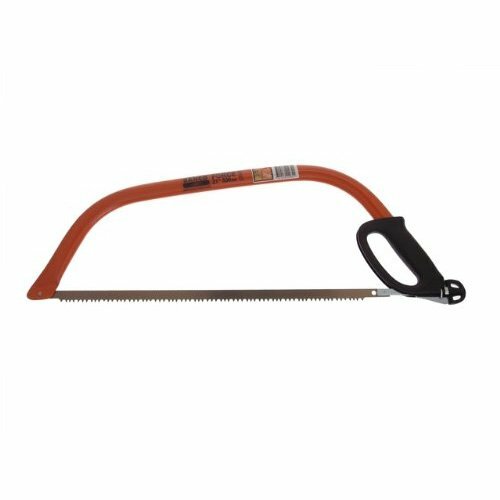 Just like the Fiskars 7029 21-inch Bow Saw, the Bahco #9 All Purpose Bow Saw has a tension lever not only for a better grip but also for a more convenient blade replacement. While its blade is significantly longer than the other entries on this list, the thinness was noticeable. It is connected to the tubular frame with a rivet, and the blade performance is average. While it does not cut fast, the Bahco #9 All Purpose Bow Saw can still cut down small pine trees and shrubs. The precision is commendable, but speed is another thing. On the other hand, Bahco should have made the handle with a tougher material than plastic. It can occasionally fall off if you do not put duct tape around it. Also, the part on the handle protecting the user’s knuckles tends to get separated from the hand saw during operations. Our fourth product comes from Bahco again. This time, the brand has a 30-inch blade that is primarily designed to cut through green wood. To ensure good cutting tension and straight cuts, the Bahco 30-inch Ergo Bow Saw uses a tensioning mechanism. As expected, this saw also utilizes the tubular steel frame and a tension lever for quick blade replacements. The handle of this hand saw is ergonomically designed with a knuckle protector that could have been sturdier. Bahco used orange enamel paint not only for aesthetic purposes but also to give it a rust-resistant and corrosion-resistant characteristic. Lastly, Bahco offers a limited warranty for any defects found on this bow saw. 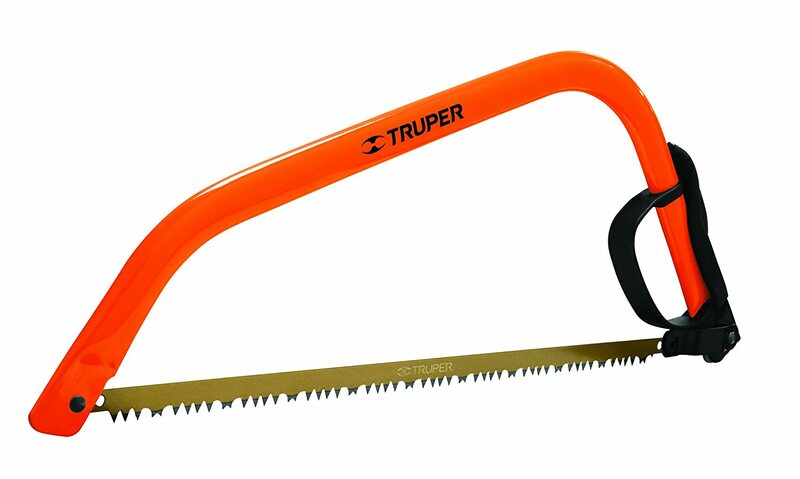 Finally, we have a hand saw from Truper that features a 21-inch steel blade. This variant uses a Cam-Lever Tension System to give a tight fit for the blade. This should keep cuts as straight and precise as possible. Furthermore, the Truper 30255 21-inch undergoes professional inspection before they are shipped. If there are any defects, Truper offers a warranty to replace the product. The materials seem alright, but the design seems like not made ergonomically. For one, the spaces between the blade teeth are too wide to provide efficient cutting. Thus, cutting dry wood can be a bit problematic. Of course, the Truper 30255 21-Inch Bow Saw can still cut through wood if there is sufficient lubrication. It does get stuck in the wood at times, but you can resume operations by sawing at a different angle. Overall, our favorite hand saw for cutting trees has to be the Bahco 30-Inch Ergo Bow Saw. It might not have the longest blade, but the length is remarkable enough to cut trees. Furthermore, the blade is not thin like that of the Bahco #9 All Purpose Bow Saw. The Bahco 30-Inch Ergo Bow Saw will allow you to cut wood as efficiently and precisely as possible thanks to the tensioning mechanism. 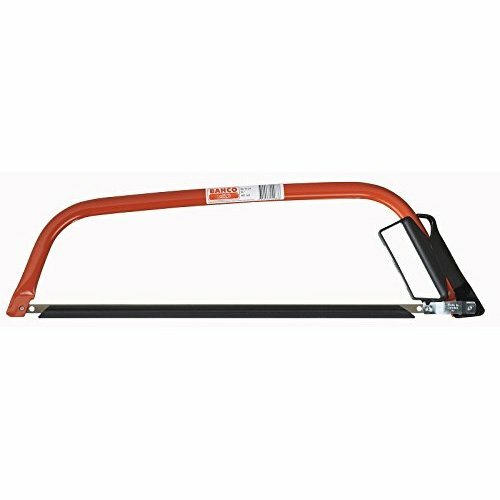 The tubular steel frame keeps it light, and blade replacements are easy using the lever. Furthermore, the ergonomic handle provides a good grip. The knuckle protector and blade protector could have been improved, but those are the only issues with this hand saw. In addition, this Bahco saw won’t succumb to rusting and corrosion. If there are any problems, you can simply use the limited warranty. We hope that you learned a lot from our guide. As long as you take note of several factors and know your preferences, you should be able to find the right hand saw. If you have any questions, feel free to give us a comment.